Blackmagic Design today announced a new family of super heavy duty Mini Converters that feature a unique design that’s machined from a solid block of aluminum for amazing strength, as well as for protecting connectors. 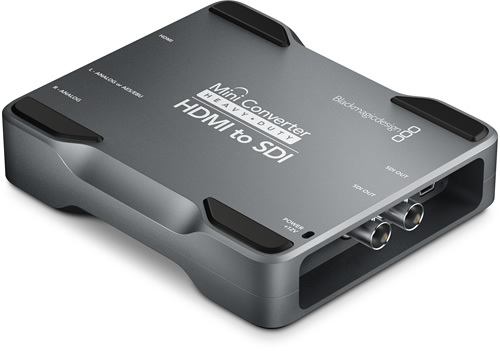 Heavy duty mini converters also include innovative features and technologies such as 3 Gb/s SDI. There are 4 models in the Mini Converter Heavy Duty product range which are all priced at only $295 US. Even with this super strong design, the new heavy duty mini converters also include extremely powerful features such as 3 Gb/s SDI technology, redundant SDI inputs, balanced analog and AES/EBU switchable audio, standard 1/4 inch jack audio connections and an international power supply that includes adapter plates for all international power sockets. To see how tuff these converters really are follow the link and check out the video. The video comprises of a military tank running over the mini converter. This is a must see.